too many Robert B's now. The name Robert has been second only to John in popularity in the Browning family for at least three centuries. That's as far as my records go. 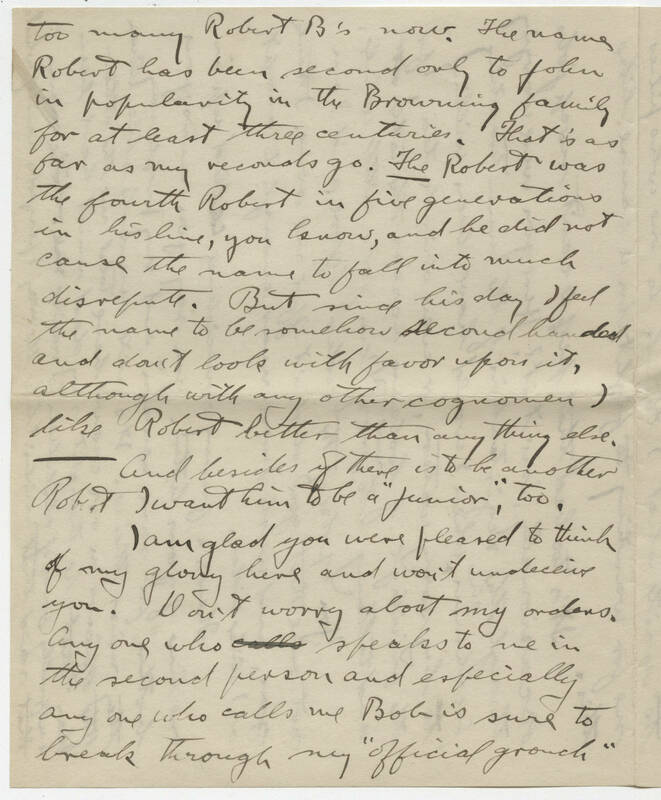 [[underlined]] The [[/underlined]] Robert was the fourth Robert in five generations in his line, you know, and he did not cause the name to fall into much disrepute. But since his day I feel the name to be somehow second handed and dont look with favor upon it, although with any other cognomen I like Rober better than anything else. And besides if there is to be another Robert I want him to be a "Junior," too. I am glad you were pleased to think of my glory here and won't undeceive you. Don't worry about my orders. Any one who speaks to me in the second person and especially any one who calls me Bob is sure to break through my "official grouch"